Read our BlackBerry Z10 review. 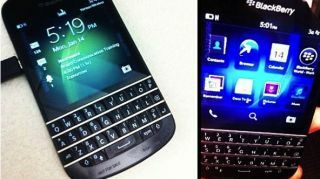 Images and video of two new BlackBerry devices have reportedly appeared online just a couple weeks ahead of the Jan. 30 BlackBerry 10 launch. First, two photos of the QWERTY BlackBerry X10 (or N-Series) popped up on the social photo-sharing site Instagram on Monday, if a source on the Crackberry forums is to be believed. Then, on Tuesday, the Austrian site Telekom-Presse posted the first hands-on video with the BlackBerry Z10 (aka the L-Series), the touchscreen-only counterpart to the X10. Neither leak really shows off much that wasn't already known or suspected about either device, but it's interesting to see them both pop up more and more as the BB10 launch approaches. Crackberry forum user "antheauxny" posted the two images of the BB10 X10 on Monday night after reportedly searching Instagram for the #BlackBerry hashtag. The keyboard-equipped phone appeared with its power cord plugged in and again in someone's hand. Despite the physical QWERTY keyboard, some traditional BlackBerry buttons are missing, but those functions will no doubt be replicated on the touchscreen in BlackBerry 10. The video featuring the BB Z10 is a little more revealing, though, giving an in-depth seven-minute look at the phone's hardware, as well as the BlackBerry 10 OS itself. The previous rumors of a 4.3-inch screen now seem just shy of the actual 4.2-inch mark, according to the video's German-language narrator, as reported by Engadget. The site also reported on Tuesday that the narrator lists a 1.5GHz dual-core ARM Cortex A9 processor, 2GB of memory, and 16GB of storage on the Z10. On Monday, it was reported that 15,000 BlackBerry 10 apps had been submitted in less than two days during a Research in Motion-sponsored "port-a-thon" for developers. That's good news for those looking to jump in bed with BB10 on day one, though doubtless not all of those apps will be approved. Last week, RIM's chief marketing officer reportedly revealed that BlackBerry 10 devices will cover all price points, ideally leaving no consumers behind.